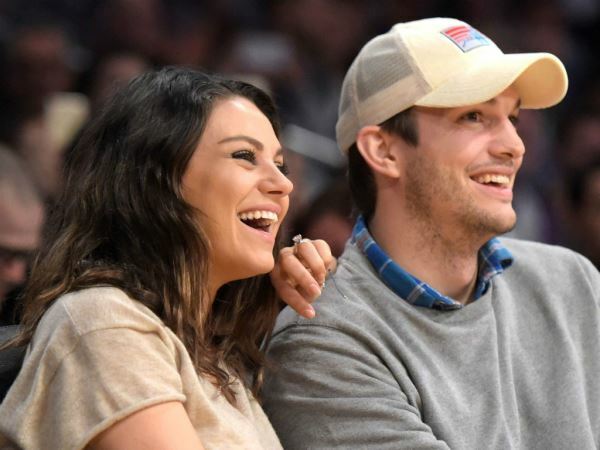 Mila Kunis has confirmed she's married to Ashton Kutcher. The couple have been the subject of intense speculation about their relationship, with many guessing they had tied the knot after Ashton signed a happy new year message 'The Kutchers' in January. The pair are notoriously private, but on the first episode of James Corden's new US talk show - due to air in the States tonight - Mila was forced into announcing the nuptials. "Either you're married or you're not," James said, while interviewing a reticent Mila. She would only reply "maybe", with the host then asking her to show her wedding finger. On it was a ring, with a victorious James then exclaiming: "They are married, look!" The 31-year-old actress seemingly blushed as she realised her secret had been rumbled. Although James was happy to press Mila when the cameras were rolling, during the advert break he was seen double checking that he hadn't upset her. The star realised it was all in good fun though and laughed as she reassured the comic that it was all fine, according to British newspaper The Daily Mirror. Mila and Ashton are parents to five-month-old daughter Wyatt, and she also chatted about how motherhood has changed her. She loves everything about being a "mommy" and enjoyed being pregnant too; so much so that the star is already thinking about having another child. The actress may like to keep some things under wraps, but she's spoken about what kind of mom she wants to be in the past. Mila already has plans for dealing with teenage tantrums - although Ashton might not be too happy about them. “That’s not my problem," she previously laughed. "That’s daddy’s problem! My sister-in-law had a little boy two weeks prior to us having our little girl and it is completely different. Everything."